Spring Morning Breakfast Blend French Roast! Look at last year’s dried up fall leaves replaced by fresh spring daffodils. I love it! Three long years ago we (note the “we” . . . I shall not point fingers!) cut off the daffodils a wee bit too soon. You are supposed to let the flowers die completely so that the energy all goes back into the bulb. If you don’t, there will be no flower the next spring. There’s nothing sadder (this is a bit of an exaggeration, I know) than a daffodil stem with no flower and indeed, for the last two springs, this is what we have had: A yard full of daffodil stems. Now it’s maybe more clear as to why I’m so excited by those flowers!! I couldn’t resist snapping a photo of my coffee cup in front of one of the bunches. 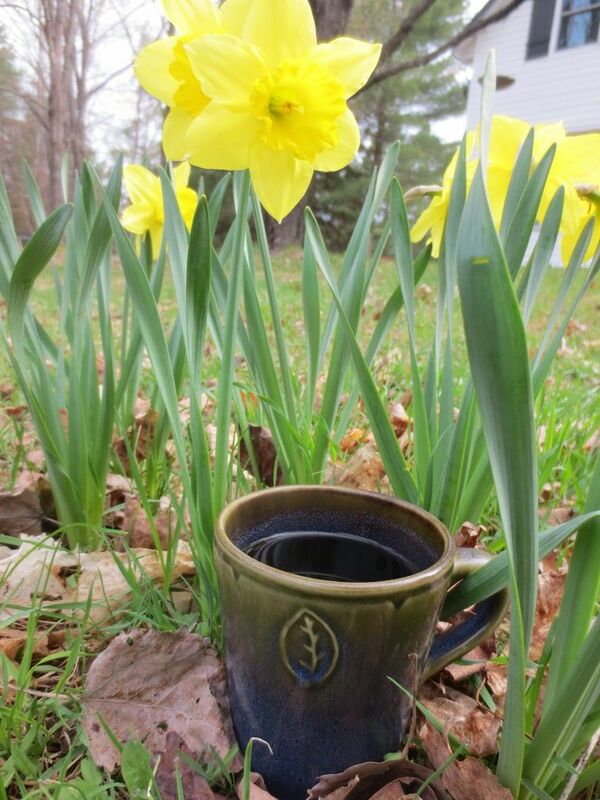 It would have been even more fitting if it was a mug full of our Spring Morning Breakfast Blend but, alas, it is not. I am a stickler to our French Roast in the morning. Even spring mornings.